Like Dracula, Sherlock Holmes, The Wolfman and tons of other famous public domain stories, Mary Shelley’s Frankenstein has had movie adaptation after movie adaptation over the years, whether they’ve been straight adaptations such as in the famous 1931 version or Kenneth Branagh’s retelling, or wackier versions like Mel Brooks’ Young Frankenstein and even one where the famed monster even came across Alvin and the Chipmunks (what a world we live in). What makes Victor Frankenstein rather special, other than breathing unexpected new life into an old tale that’s been done to death, is that it finds many ways to pay homage to some of those past adaptations as a way of saying “thank you” for all the crazed imagination they’ve given us – or, at the very least, director Paul McGuigan and writer Max Landis. 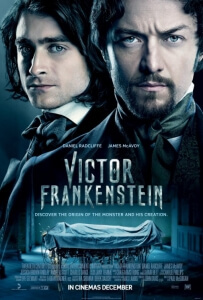 Not so much a straight telling of the story but rather a wildly off-kilter sort-of-origin-story, the film centres around the main relationship between the titular scientist (James McAvoy) and a nameless hunchback (Daniel Radcliffe) whom Frankenstein rescues from his abusive life in the circus, instantly cures him of his deformity by removing the pus from his back (you might want to look away at that point), and gives him the name Igor after his MIA flatmate. Together, Igor and Frankenstein work to revolutionise modern science – or as modern as it can be, given that it’s Victorian London – with experiments that eventually lead up to the one we all know happens in the original story. Along the way, they incur the wrath and interest of several outside figures, from Freddie Fox’s baby-faced pseudo-Malfoy figure, to especially Andrew Scott’s obsessively religious detective (Scott and McGuigan are just a couple of the many links with BBC’s Sherlock; also look out for show regulars Mark Gatiss and Louise “Molly” Brealey in cameo roles). The hat-tipping of this movie to several Frankenstein films before it is endless, but incredibly entertaining. Igor, for example, is a character that was never in the original source material but whose sources stretch as far back as the 1931 version; Frankenstein’s name is mispronounced as “Frahn-ken-steen”, as it is in Young Frankenstein; and the over-the-top campy nature of the performances, sets and even costumes is surely a more subtle nod to Branagh’s typically indulgent style of direction in his version. The way that Landis works in these little references here and there, though McGuigan’s heavily vibrant direction, makes this more or less a passionate love letter to the filmography of Frankenstein, and it is with this passion that the film is far more enjoyable than it has any right to be. Even when you take out those elements, it’s still a really fun movie to watch – ESPECIALLY for McAvoy’s performance here, in a role that never required him to put much effort into but by God he goes all out here, delivering something that is both manic and strangely captivating at the same time. Every moment he’s on screen, he’s just having the time of his life, like he’s discovered that the secret to everlasting happiness is by acting as the most psychotic madman to ever walk the planet, and he more than owns the part. Radcliffe, the clear main draw for the slightly younger crowd, is also pretty good here too; he shares good chemistry with McAvoy as well as Jessica Brown Findlay’s love interest, and he brings across exactly the right amount of sympathy and likability to this character that you want to see him, as well as his scenery-chewing friend, get out okay. It definitely isn’t perfect, as there are a few scenes and sub-plots that seem to go nowhere, and it starts to get a bit more flabby as it gets into its third act, but for the most part it’s FAR better than most critics will have you believe (28% on Rotten Tomatoes? Really?) and, most importantly, it’s entertaining as hell. There’s not a dull scene at all in this movie, and for a film based on a book that has been adapted countless times now, that’s an impressive statement to make. Take it for what it is, because Victor Frankenstein is a fiery letter of passionate love to one of the most famous gothic horror stories of all time, as well as its countless appearances on the silver screen. Victor Frankenstein is a surprisingly fun and entertaining hat-tip to the past adaptations of Mary Shelley’s book, which is made more enjoyable thanks to James McAvoy’s wonderfully-OTT lead performance.